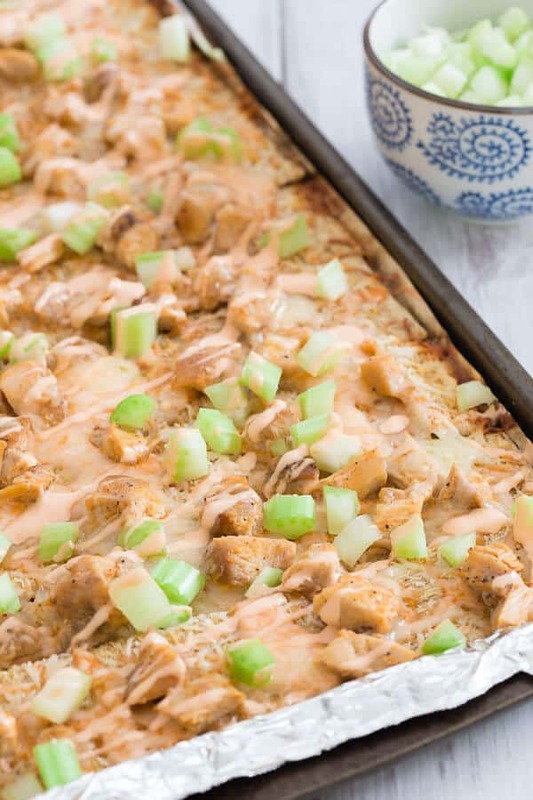 These Triscuit nachos are topped with buffalo sauce, buffalo chicken, cheese and crunchy celery. They’re everything you love about chicken wings in a healthier nacho form! There’s this pizza place called Giacomo’s conveniently located right smack in the middle of the 2 mile drive from CrossFit back to my house. Since I can’t for the life of me turn myself into a morning workout person, passing it every single weeknight around 6-7pm can be a bit dangerous. Particularly since discovering their buffalo chicken thin crust Sicilian pie. *This post is sponsored by Refinery29 and Triscuit. I was compensated for this recipe, however, all content and opinions are my own. Yes, I realize thin crust and Sicilian in the same sentence is a complete contradiction and Ulysses and I argued about that being its actual name for months before finally looking it up on their website. It is indeed called that and while I’d normally judge a pizza joint for their obvious oversight to the fact that Sicilian implies square and puffy dough not thin crust, one bite into this pie, I forgave them. I’m normally not a fan of pizza without tomato sauce, I mean, isn’t that one of the 3 required ingredients?! However, this pie is like a chicken wing and a pizza had a baby and instead of tomato sauce, it uses buffalo sauce. 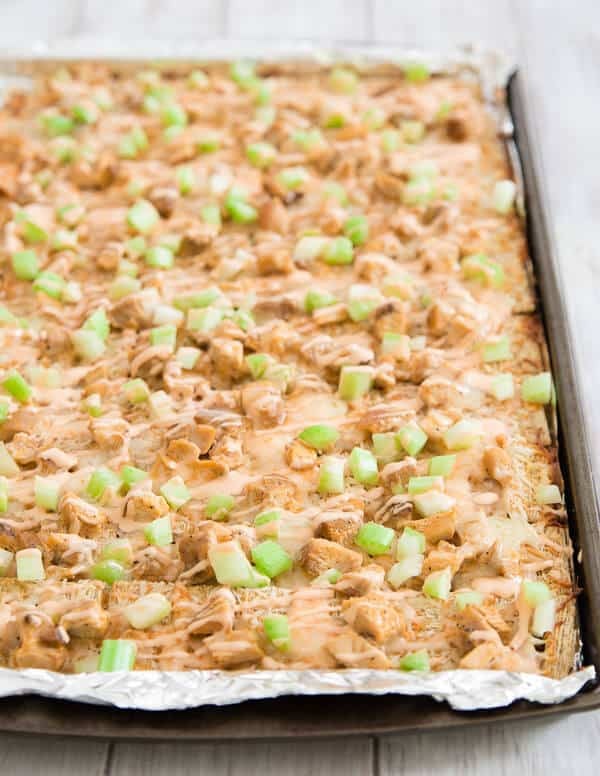 Cheese and chicken go on top and then my absolute favorite ingredient gets sprinkled on at the end for a cool crisp bite, celery. I never really thought the day would come that I would call celery a favorite ingredient in anything but it totally MAKES this pizza. It offsets the spiciness perfectly and sometimes if they’ve gone too light on it, I’ll actually chop up more at home and throw it on for the optimal celery to buffalo sauce bite. The amount of times I have a text from Ulysses 15 minutes before my workout ends saying “called in the pizza, pick it up on your way home” is kind of embarrassing, almost as much as the fact that they’ve never seen me in anything besides chalk covered workout clothes and sweaty hair looking like I just walked through a tornado. So, I had an idea to take this pizza and recreate it as buffalo chicken nachos for the ultimate snack (or meal in all honesty) that can be ready in 20 minutes using your favorite household cracker, Triscuit. It’s got all the flavor of our beloved pizza, minus the 30+ minute wait and the $17.96 price tag. Is it sad that I know the exact price of the pizza with tax? Probably best not to answer that. 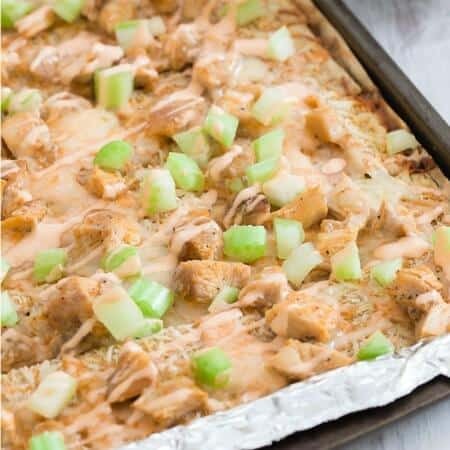 These Triscuit nachos are topped with buffalo sauce, buffalo chicken, cheese and crunchy celery. They're everything you love about chicken wings in a healthier nacho form! Line a baking sheet with tin foil and place Triscuit Crackers in an even layer to cover the entire pan. Mix the yogurt and buffalo sauce together in a bowl. Drizzle all but 2 tablespoons over the Triscuit Crackers. Sprinkle the mozzarella on top of the buffalo sauce then place the chicken on top of that. Sprinkle the cheddar on top of the chicken and place the baking sheet in the oven for 10 minutes to melt the cheese and make the Triscuit Crackers crisp. Remove from oven, top with chopped celery. Drizzle with more yogurt and buffalo sauce mixture if desired, serve immediately. 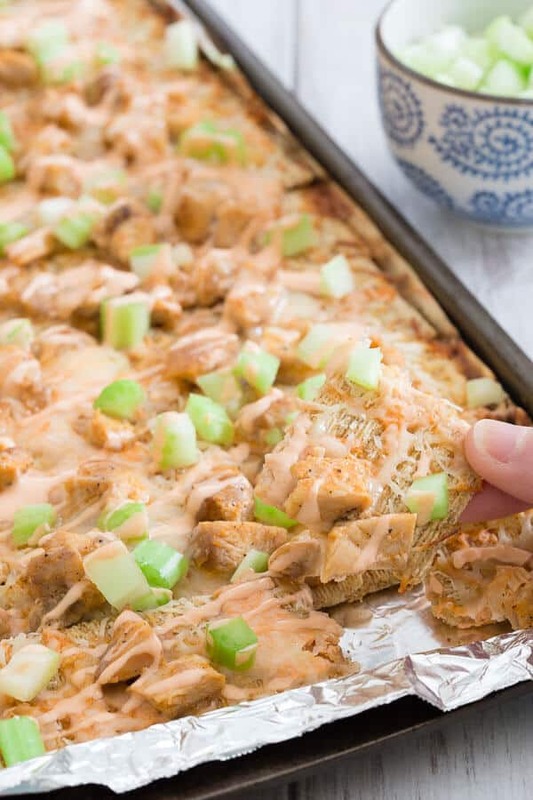 We LOVE Triscuits and anything buffalo chicken in my house…so these are totally our jam! Love how easy and tasty these look. Pinned! Just yesterday I was eyeing all the new flavors of Triscuits….like their thin, sweet cinnamon ones? Um yes. Perfection. This is rather brilliant to use Triscuits as nachos. I cannot wait to try it. But these nachos are for chowing down, girl, these are like my dream nachos! These nachos would be a HUGE hit in my household – Triscuits (even plain) are basically crack to us, so I’m sure we’ll be fighting over even the last crumb of these. Yum! Triscuits are the best! (I totally miss them now that I’m gluten-free. Boo!) I think using them as nachos is absolutely brilliant. I adore Triscuits—and these nachos look extraordinary!!! Holy wowsers!! This sounds right up my alley!! I love these!! I pinned them to my game day board…but they are totally going to be dinner at our house!! Wow, what a great idea! This is totally my kind of snack. Triskets are always a favorite snack at our house. This looks fantastic! I have to try making this soon. Love triscuits and this sounds so good. Thank you and Happy Valentine Day.